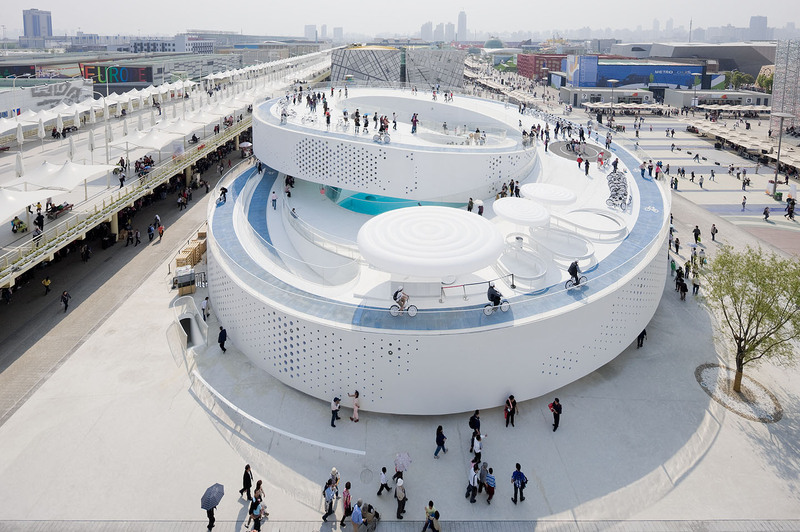 The Danish Pavilion at the Shanghai expo in 2010, A project by Bjarke Ingels, allowed for visitors to experience it in very different speeds including walking and cycling. Here are some great pictures that give you a sense of this building. We reintroduce the bicycle in Shanghai as a symbol of modern lifestyle and sustainable urban development. The Danish Pavilion and the entire exhibition can be experienced on Danish designed city bikes that are free for the guests to use. The building is designed as a double spiral with pedestrian and cycle lanes taking you from the ground and through curves up to a level of 12 meters and down again. In this way you can experience the Danish exhibition both inside and outside at two speeds — as calm stroll with time to absorb the surroundings or as a bicycle trip, where the city and city life drift past.